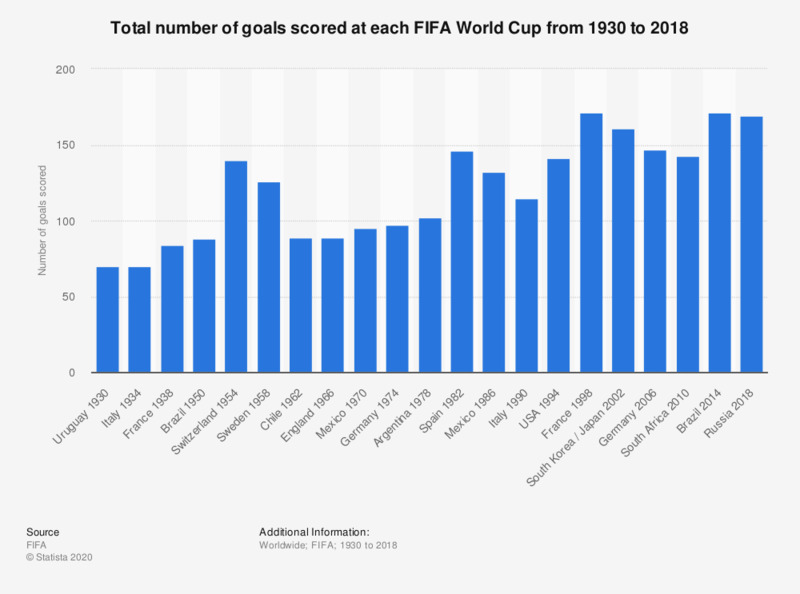 This graph depicts the total number of goals scored at FIFA World Cups from 1930 to 2018. At the World Cup tournament in Russia in 2018 a total number of 167 goals was scored. The record for the most goals scored in a tournament is 171 (at an average of 2.67 per game), jointly held by the World Cup in France in 1998 and the 2014 tournament in Brazil. The most recent World Cup in Brazil also holds the record for the most amount of different scorers in a single tournament with 121 players. The fewest goals scored in a single tournament stands at 70, which occurred at the first two World Cups in 1930 and 1934. This can be explained by the fact that only 13 and 16 teams respectively took part in the finals and so fewer games were played overall. The format for the finals was changed for the 1982 World Cup in Spain in which 24 teams participated. The current format, first implemented in France 1998, sees 32 teams split into eight groups of four. The 1954 World Cup in Switzerland saw the most goals per match, with 140 goals being scored in 26 matches at an average of 5.38 goals per match. At the other end of the scale, the Italy 1990 World Cup had the fewest average goals per match with the ball hitting the back of the net 115 times in 52 matches, thus averaging 2.21 goals per match.